This group was formed in 1969 in Enschede. The first lineup was: Hilda Felix (vocals), Henk Westendorp (vocals, later in Superfly), John Snuverink (vocals, guitar), Frans Schaddelee (bass), leader Koos Versteeg (vocals & keys) and Ruud Nijhuis (drums). In 1972, only Koos and Rudi remained in the group, and the rest of the band comprised: Getty Kaspers (vocals, in 1976 solo as Getty), John Gaasbeek (bass, in 1964 in the Stora Combo, later known as Orkest Freddie Golden, left in 1976), Chris de Wolde (guitar) and Ard Weenink (until 1976). New members joined in 1976: Hans Nijland (bass, in 1977 replaced by Nick de Vos), Betty Vermeulen (vocals), Marianne Wolsink (vocals, ex-Head). In 1975, Teach-In participated in the Eurovision Song Contest. Nick De Vos' brother Wim replaced Frans Schaddelee, first temporarily when the latter fell ill, and then was asked to stay permanently. Wim joined the band in 1972 and stayed for about six months. Earlier, he had played with Chris de Wolde in The Honest Men. Besides Teach In, Wim played in several bands, including Adrian van de Berg, Patricia Paay (in Himalaya - one of their hits was "Put your hand the hand"), Jan de Hont, Wim Overgaauw, Eef Albers, etc. Unfortunately, Henk Westendorp later died in a car crash. Teach In were Getty Kaspers, Chris de Wolde, Ard Weenink, Koos Versteeg, John Gaasbeek and Ruud Nijhuis. The band was formed in 1967, with a different line-up from the one in 1975. Singer Getty joined the band in 1971, when they got their first recording contract with producer and composer Eddy Ouwens. 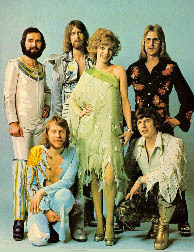 In 1974, the band had three Top 15 hits, after which their winning Eurovision entry, "Ding-A-Dong", was recorded, which resulted in a chart entry in nearly every European country. Teach In toured Europe for the next two years, but the success took its toll when the band split up in 1978. Getty tried a solo career, but wasn't succesful. In 1979, Ruud Nijhuis and Koos Versteeg reformed the band, this time with two new female singers. After three more hits, the group split up again. In 1997, news came that the original line-up (with Getty Kaspers) had re-recorded some of their old hits and had plans to tour again. Getty Kaspers, ex-singer of Teach In. After Getty Kaspers and John Gaasbeek left Teach-In, Getty recorded solo and, together with Wilma van Diepen, formed Balloon.